“Who are you who mumbles in the dark?” .. we are the bloggers and other lost souls who can see that if America is ever to be great, it has to seek to fulfill its promise that has drawn millions but has hardly been achieved. On the contrary, we live in dark times, a supposedly Christian nation which has completely sold it soul for greed, the dreams of empire snorted like fumes by a criminal class who have become to believe they are gods. If we look at the Trumps who are ascendant on the Olympus of our political structure, we must look in the mirror and wonder what have we become. Martin Luther King Jr.'s great speech I Have a Dream has been swept under the carpet and although school segregation is apparently against the law of the land, economic disparity is its prime value grown out of a twisted Christian idea of prosperity and goodness. Because this is the great silent scream we are faced with today, in a world that has to be reminded that black lives matter: “we are so lost” - we are lost in a growing world of surveillance and control which enforces a toxic ideology of power over others and whoever has the fastest computer wins. We are lost in a Soviet style hall of mirrors where one day the president plants a tree to honor the friendship of the USA and France, and the next day the tree disappears, a prop in a propaganda theater that meant nothing more than the aggrandizement of the president himself. This is our greatest challenge today, that meaning is eroding from our lives. 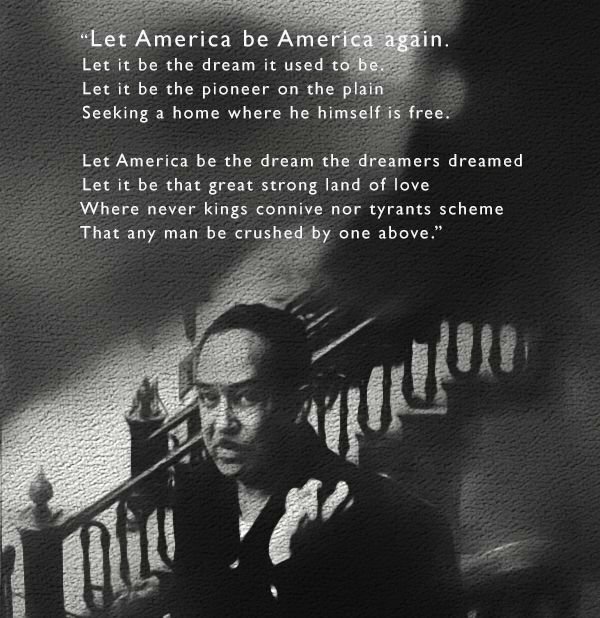 So on this labor day I found Langston Hughes' great poem “Let America Be America Again”. Its not about reclaiming any greatness, defined by sick white nationalists whose ethics are twisted beyond recognition, but rather to find our own greatness within ourselves in a brotherhood of man. Hughes' poetic voice evolves from the work of Walt Whitman, Paul Dunbar and others, a multiplicity of the possibilities of self, not a confined structured hierarchical definition from above, but one which is always in the act of becoming. If America is to be America and fulfill its promise, it must be a place where opportunity is there for all, not just the few, that there is a place at the table for all, not just the anointed ones. Congratulations! This post has been upvoted from the communal account, @minnowsupport, by praguepainter from the Minnow Support Project. It's a witness project run by aggroed, ausbitbank, teamsteem, theprophet0, someguy123, neoxian, followbtcnews, and netuoso. The goal is to help Steemit grow by supporting Minnows. Please find us at the Peace, Abundance, and Liberty Network (PALnet) Discord Channel. It's a completely public and open space to all members of the Steemit community who voluntarily choose to be there.